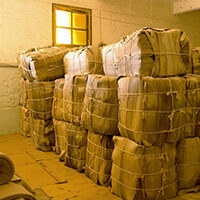 WHEN THE WRAPPER LEAVES ARE AGED, IT IS TIME FOR THEIR FINAL SORTING AND CLASSIFICATION. One movement deftly removes the entire central vein of the leaf leaving its two halves ready to be graded into some 20 finely distinguished sizes and shades. In the past, these tasks were performed only by women. 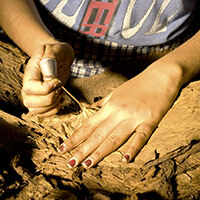 Working from piles of leaves on their laps thus lent weight to the popular myth that Habanos are rolled on maidens’ thighs.